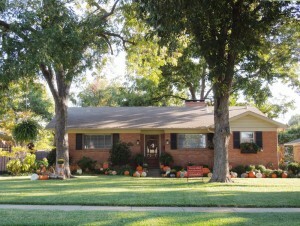 October 2015 Yard of the Month! We are thrilled to be awarded this awesome month’s YOM. We look forward to this time of year and seem to consistently be one of the earliest at Calloway’s to get their first batch of the best pumpkin and gourde varieties! The best part for us is seeing the neighbors come out in excitement when the first assortment is being unloaded from the car or seeing families stop by to take photos of their little ones perched on a pumpkin. We like to ‘keep it classy’ with more of a harvest pumpkin patch look leading up to the big night when we bring out more of the spook factor. On Halloween night we have a little graveyard, awesome lighting and fog, ghosts and ghouls putting on a show in one of the big front windows and jacks flickering around the yard. A question we always get is how to keep squirrels from eating up our pumpkins. Here’s what we have tried with some success: Use any cheap aerosol hairspray from the Dollar Store and give a nice even coat to each. This makes the initial taste bad at first bite and they usually move on. This will give the pumpkin a nice sheen too. Be warned though, as I put way too much hair spray on this year and after a round of the sprinkler system white marks and spots covered these pumpkins and we had to scrub with soap and warm water many times and even use a little turpentine to remove most of the white build up. We have noticed over the years that they tend to mainly go for the jack o lantern pumpkins since they have the softest skin which is good because the ornamentals are the most expensive. Here’s the All Time Best Way to keep them off your prize winners: a small offering. 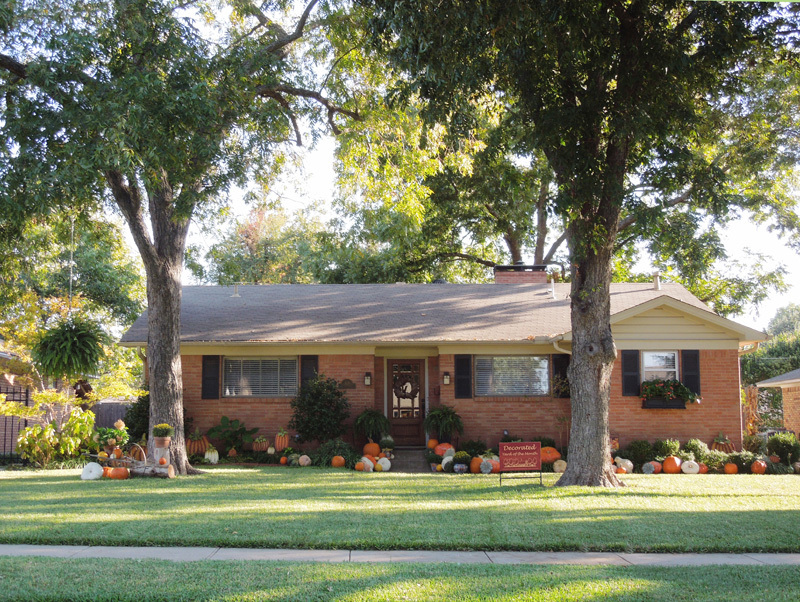 This year we decided to buy the cheap pie pumpkins and put one or two at the base of our trees towards the back so they’re not visible from the street. They go for these immediately because they’re very soft skinned and if frightened they can just race back up the tree. One will last about 3 days until it’s so devoured or rotten they move on. It really works! Happy Halloween everyone from 619 Greenleaf!